Super Savings Item! 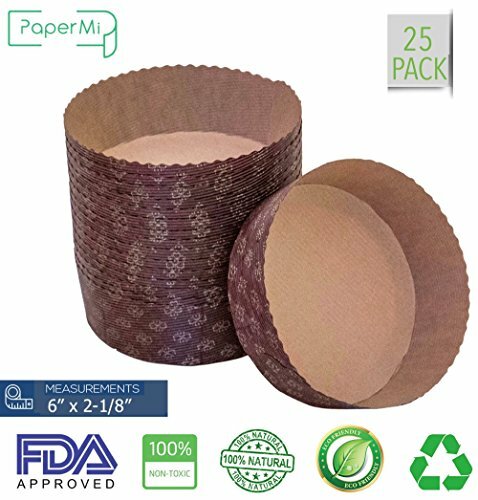 Save 33% on the Round Paper Baking Cake Pan, Disposable Baking Mold 25ct, All Natural FDA Approved, Recyclable, Microwave Oven & Freezer Safe, Providing Beautiful Display For Baked Goods. (6”x2-1/8”) by PaperMi at My Beautiful Cake. Hurry! Limited time offer. Offer valid only while supplies last. BEAUTIFUL DESIGN PAN dark brown pans are accented with a lovely gold floret design, beautiful packaging option for your treats and providing a beautiful display for serving baked goods to a crowd or sale. gift-ready baking pans, easy to dress up for gifting, since they're prettier than regular bakeware. EASY -bake right in the pan, Cut down on time consuming cleanup, designed to eliminate metal baking pans. If you have any questions about this product by PaperMi, contact us by completing and submitting the form below. If you are looking for a specif part number, please include it with your message.